When the AT experts decided to label Pennsylvania rocky, they must have based their evaluation on the section between PA 309 and Palmerton. “Rocky” seems like an understatement for what I encountered today. 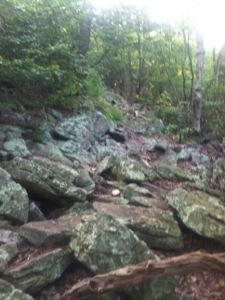 The portion of the trail from the Knife Edge to Bake Oven Knob was downright nasty. At times I thought that there must be a better way to get from point A to point B without putting my life in danger. I tried to keep my mind on each step as I slowly made my way over the slanted rocks with exposure on both sides. This was probably the most technical section of trail that I have encountered thus far. 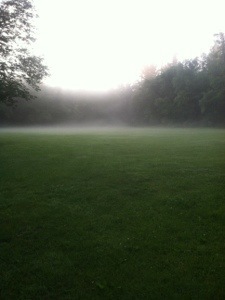 The day began at the Allentown Hiking Club Shelter. When I awoke at 6:00 after a rather restless night, I couldn’t believe that I was the last to awake. Shadow and Shade were already packing up their gear and Speck was having breakfast. After hastily downing a fruit pie and some water, I hiked out of camp with Speck at 6:55. Early in the hike all went well. We hiked steadily, enjoying a conversation as we walked. 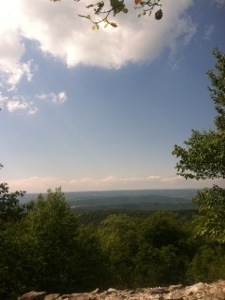 At Blue Mountain Summit Rd. we took a break to fill our water bottles at the restaurant right off the trail. Ken, the owner, came out for a chat, offering some information about the area. After returning to the trail the real hike began. About three miles later Speck and I reached the infamous Knife Edge, only about .2 mile in duration, but very strenuous. 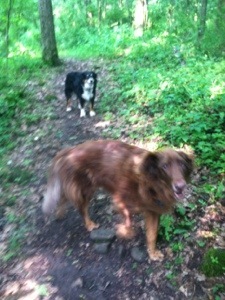 I hiked ahead for awhile; then Speck took the lead. Even though the hiking was tough, we took the time to take a few action shots of each other. Speck called the section exhilarating. I called it scary. Trying to harness the adrenalin rush as best as I could, I just kept reminding myself that a blind man had once hiked this. It didn’t really help, but Speck’s encouragement did. 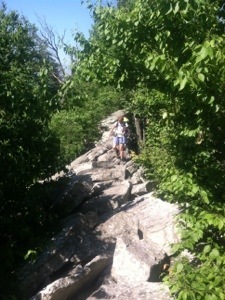 When we finally reached the end of the perilous section, Bear Rocks awaited. These rocks, however, were not exactly on the trail, so even though we had to hike over another rocky section, the difficulty was lessened. But at about the time that I had regained my composure, we were confronted with Bake Oven Knob, another technical, rocky segment. 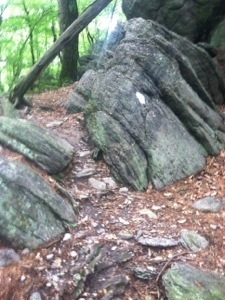 As with the Knife Edge, our pace slowed, but Bake Oven Knob proved to be less challenging although still very difficult. 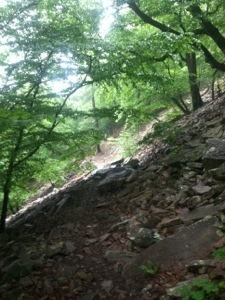 After all the rocky sections, I think we both welcomed the more gentle terrain for the remainder of today’s hike. 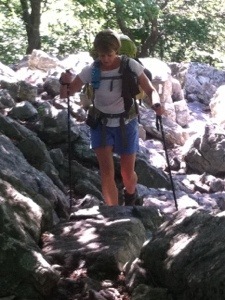 Like so many other days, we saw few other thru hikers. 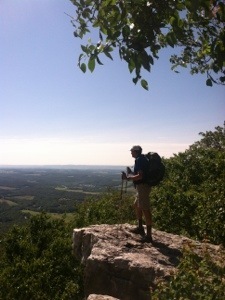 We did meet several section hikers, most southbound. 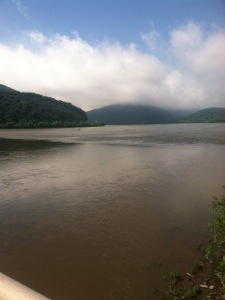 When we reached PA 873 and the Lehigh River we were left with a mile and a half to Palmerton. Fortunately, a gentleman in a van, Bob, agreed to drive Speck and me into town. We checked in at the Jailhouse Hostel on Delaware St. The hostel is located in the basement of borough hall near the police station. 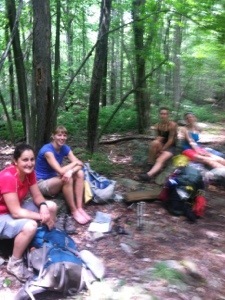 Other thru hikers at the hostel were Medicine Man, Kudo, Broken Pack, Doc, Boone, and Spider Mac. Even though there were challenges in today’s hike, I somehow managed to stay vertical all day. By taking my time, focusing on each step, and remembering that many were offering up prayers for me daily, I succeeded. 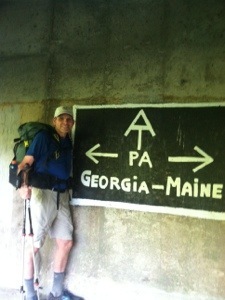 But that’s what the Appalachian Trail is all about, a series of challenges that have to be met daily. Like today, tomorrow will present more difficult sections of trail that will have to be dealt with. For now, it’s getting late. I’m writing this from a bench in a park across the street from the hostel. Bugs are circling the street lights overhead. Another good day draws to conclusion, yet tomorrow more adventure awaits as I climb out of Lehigh Gap on the Appalachian Trail. The last time I saw Speck she was walking up the trail out of my hike forever, or so I thought. That day I struggled to limp the final three miles to Jennings Creek where I shuttled back to Daleville to treat my Achilles tendinitis. 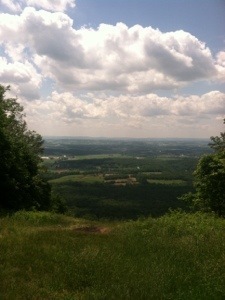 Today Speck walked back into my hike on a beautiful day in northern Pennsylvania. On the trail for a short section of PA and some of NJ, she appeared when I thought I’d be hiking alone for awhile. Her company was definitely welcomed and appreciated. My day began with a hitch from Hamburg back to Port Clinton. 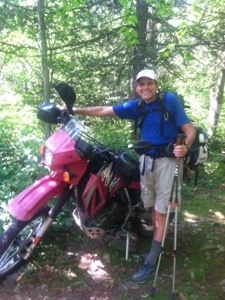 Two trail angels with a work truck offered the lift as I finished my breakfast at the Microtel. Dale hoisted my pack into the back of the truck as I climbed up to the front seat. His co-worker, Ben, rode in the back. After the short ride I found myself hiking by 6:55. 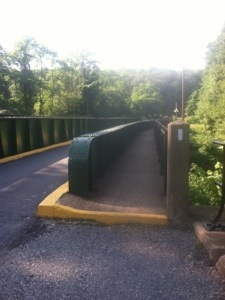 To begin the day I walked under a bridge and up a steep ascent of 900 feet. Before long Speck was hiking with me. We took a break at Reservoir Rd. 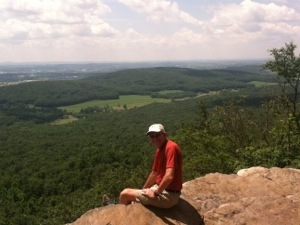 and then another at Pulpit Rock, which offered another spectacular view. It was hard to leave the beauty, but after a few pics, we moved on. The trail today afforded us much variety. At one time we were strolling down what seemed like a pleasant country road. At another we were faced with various sizes of rocks to climb over or navigate around. Then there were the short sections of smaller pointed rocks which made finding a place to step challenging. 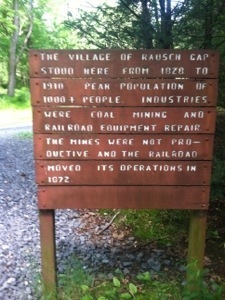 But that’s what the AT in Pennsylvania has been all about…..variety. From the farmland to the rocks, it’s all been good. Not having seen Speck in over a month, we spent much of today’s hike talking. It was good to catch up with my friend. She told me about the rest of her section hike in VA after we went our separate ways, and I filled her in on my days with Molar Man. Out conversation made the day pass quickly despite the often difficult terrain. 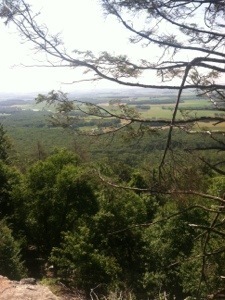 We took another break at The Pinnacle, which afforded us another, OK, I’ll use it, breathtaking view. It was there that we saw Scarecrow drying some gear. One of the highlights of the day came when Speck and I met Under His Wing and In His Feathers. 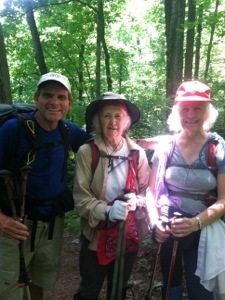 The 80 and 75 year old sisters have been section hiking the AT since they started receiving social security. 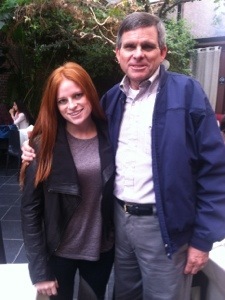 A true inspiration, they chatted for a good while with Speck who was fascinated with their endeavor. When we reached the road leading to the Eckville Shelter, Bernie the Whittler was waiting by the van. He allowed Speck to select one of his carved figures. Before we headed on, the two ladies walked up, ending their hike for the day. The last few miles proved a little more difficult, mainly I think because we were tired. After all it was Speck’s first day back on the trail. Still even though the trail caused some difficulty at times, we were able to hike 22.2 miles to the Allentown Hiking Club Shelter, arriving a little after 6:00. Speck was nice enough to boil me some water for a hot meal. The lasagna she had suggested was delicious. I suppose I could get used to this sleeping in shelters and eating trail food if I so desired. We shared a picnic table, adjacent to the shelter, and good conversation with Shadow and Shade, an older couple from North Carolina. 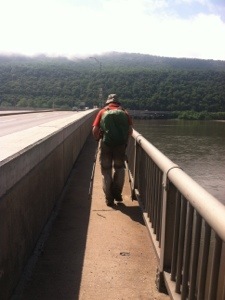 They began their hike in Harper’s Ferry four weeks ago, hiking comfortable miles each day. They hope to get all the way to Maine. They’re just not sure when. So tonight I’m back in the woods. This shelter is nice. There are even a couple of canvas chairs and two bunks. The shelter sleeps eight, so the four of us have plenty of room. Darkness has arrived. The others may already be asleep. What sounds like a family with five or six boys of about ten or eleven just walked up. They appear to be looking for a place to camp. One said he thought he heard a wild animal. I hope not. I’m tired. It’s been a good day to hike with a friend. 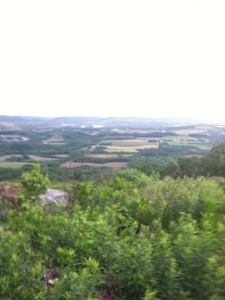 Tomorrow we’ll head toward Palmerton, the next town on the map up the Appalachian Trail. There’s something special about waking up at 7:30 in a comfortable bed. When the bed happens to be in a four star motel within two miles of the trail, it just doesn’t get any better, at least not for this “town guy” hiker. Apparently I’m not the only one with an affinity for luxury because other hikers were milling around the lobby as I enjoyed the impressive complimentary breakfast. Section hikers Jim Dog, from Utah, and Beaker, from Kentucky, joined me at my table for some trail conversation. Jim Dog plans to shuttle up to New York with his daughter today to meet his wife for a section. Beaker is headed back to Virginia to pick up some miles. I told both about Don and shared my web site with them. Also in the dining area were Medicine Man and his 23 year old son Kudo. 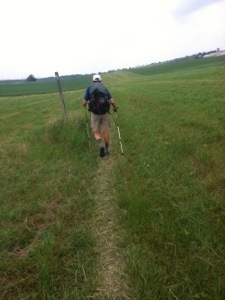 The father and son team from St. Louis had also hiked the 24.1 yesterday to reach Port Clinton. They started at Springer ten days before I did, but they had gone home for a few days before continuing their hike recently. So I meet two more thru hikers for the first time. When Medicine Man said that they hoped to finish in early August, it put into perspective how much ahead of schedule I am. Still, I never know what may occur from day to day. I’d rather be ahead of schedule than behind, trying to catch up. So as I relax in my comfortable surroundings, I wait. I wait for tomorrow when I again hit the trail. As I wait I am reminded of the days of happiness that the trail has given me. But I am also cognizant of times of loneliness and despair. It seems that every time an ounce of sadness or perhaps a tinge of melancholia surfaces to potentially disrupt the hike, something wonderful happens. I’ve heard that an old friend is again on the trail. So possibly tomorrow I’ll have the good fortune to be joined by another hiking partner when I return to the woods to hike north up the Appalachian Trail. It felt odd starting a hike solo today. It also felt strange hiking with a full pack again after a week of slack packing. Nevertheless, that’s what I did. 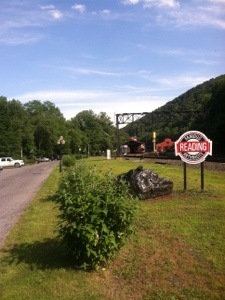 After breakfast at the motel, I used my first shuttle in several days to return to the trailhead at PA 501. During my meal I overheard a member of a tour group use a phrase I haven’t heard in some time (Well, I’ll be dog! ), which prompted me to ask where they were from. When a member of the group said Tuscaloosa, Alabama, I told Bob that I was from Georgia. I also gave him my web site before heading out the front door. After being dropped off at the trail, I began walking at 6:40. Early in the hike I passed Fis and later was passed by Wrangler. I would see no other people all day until the last mile going into Port Clinton. The trail was lonely today, my friend. As the morning progressed I took a break at Round Head to just enjoy the view. Then I hiked steadily until just past noon when I reached a campsite where Wrangler had built a fire and was cooking some lunch. He explained that the fire was to keep the bugs away. That sounded like a good idea, so I joined him. 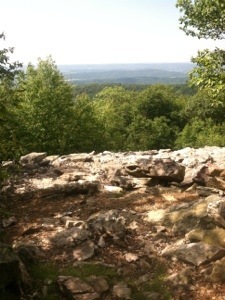 After lunch I continued at a quick pace until I reached the Eagles Nest Shelter. I had actually intended to stay the night there; however, since it was only 1:20, I just couldn’t force myself to stop with only 15.1 hiked and seven hours of daylight remaining. So I pushed on. In fact, I covered the two miles from the shelter to Shartlesville-Cross Mountain Road in 38 minutes. While the terrain allowed, I kept up the pace. Then when the rocks appeared, I slowed. Even with some lengthy stretches of rocks, usually small in size, I arrived at the small town of Port Clinton, PA before 5:00, having hiked 24.1 miles with a full pack. When I did reach the road by the train tracks, I took a break at a picnic table before crossing the short bridge into Port Clinton. Arriving at PA 61 going into Hamburg, I thought I’d give Microtel a call to check on rates. As I was talking a truck stopped. The lady in the passenger seat asked if I needed a ride. Fred and his trail angel wife drove me right to the front door of the motel. Also in the truck was Fables, a young lady who started at Springer the week before I did. Like so many others, I had not seen her until today. From South Carolina, she was staying with the trail angel couple. Even though I hiked a ten hour day alone, the miles went quickly. At one point I thought about creating an imaginary hiker friend that I could share the trail with when no one else is around. I gave him a name, a place of origin, and a rather bizarre personality. Perhaps in future days, when there’s nothing else to write about, I’ll include a more in-depth description of the fictional hiker. For now, however, I think I’ll stay with reality. 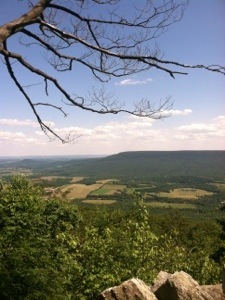 And the reality of the moment is that I need some rest before tackling more big mileage days on the Appalachian Trail. With my buddy Molar Man now a day up the trail and Linda en route to the Harrisburg Airport, I must admit a tad of despondency has crept into my psyche. Looking for a panacea, I decided to take Father’s Day off and treat myself to the final round of the US Open. Remembering the special times when I enjoyed the tournament with my dad, and later with my son, has brought me comfort on an overcast afternoon. Despite being alone in a Pine Grove, PA motel, the memories are comforting even if they bring with them a little melancholia. There will hopefully be other Father’s Days in future years when, in the company of Sam and Rachel, I will nostalgically remember this day. That’s what the AT and life are all about….. a compilation of memories. Earlier today Linda and I shared a leisurely breakfast and then a time of relaxation near the pool. 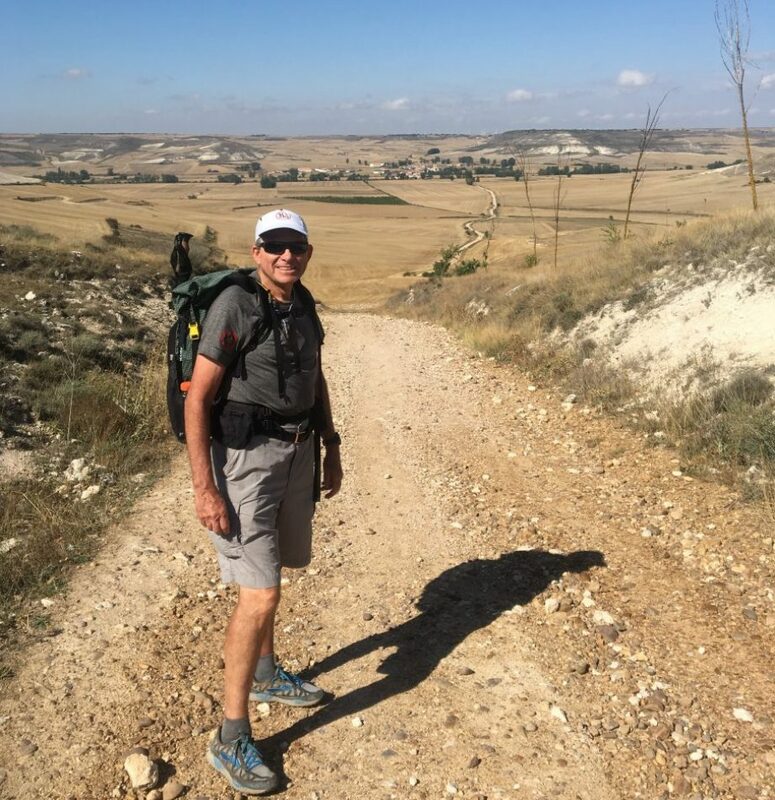 When I sighed that I still had 996 miles to walk, my lovely wife replied, “That’s soooo much better than 1000.” She qualified her response with, “That’s why the price tag says $3.99 instead of $4.00. It’s all psychological.” Perhaps she has a point. By this time next week I should be in another state and have fewer than 900 miles remaining. A positive attitude continues to be paramount to success. I never entered a road race without thinking I would finish. So I’ve tried to maintain the same mindset as I hike. The summit of a mountain in Maine marks the finish line. I also thought about my nephew Brent throughout the day. This is his first Father’s Day without his dad. They shared so much. From fishing and hunting to little league to trips to watch the Braves, they were an inseparable father and son. Don was proud of the man Brent has become. Above all, he felt blessed that his son was and is a man of faith, just like his dad. 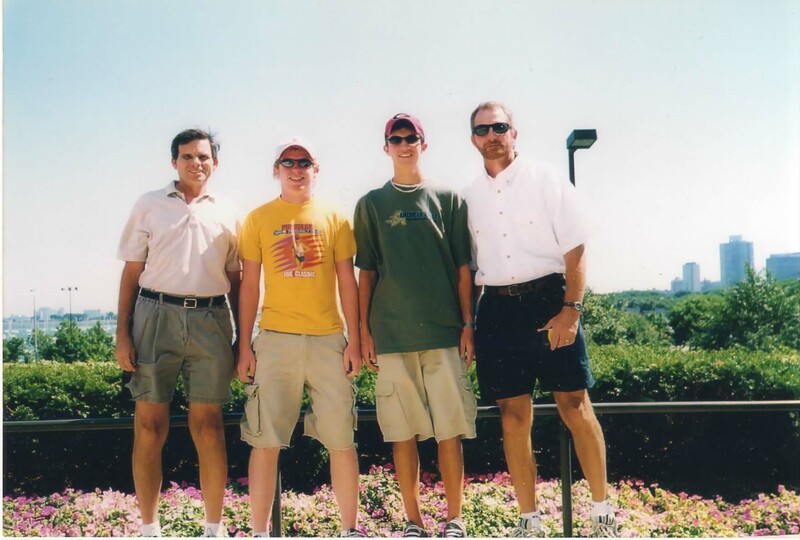 As our mom grieved the loss of a son, Brent’s wife Lori tried to comfort her with, “Brent is just like his dad and we still have him.” Those of us who have lost our dads cling to those special times of the past. Times of childhood when Dad could make everything OK. Good times they were indeed. So many have been supportive of my hike. From family to friends, to former students I taught and athletes I coached, to people I have never met, yet who have taken the time to send a guest book entry or write an email, I have truly been blessed every day of my walk. So many people have touched my life over my 62 years. One, Bobby Gardner, who ran cross-country and track on my teams for four years and later excelled in college and the US Army, sent a Happy Father’s Day text this morning. He never misses contacting me on this special day. It’s rewarding to know how one’s life may impact another’s. Those same kind of special relationships are formed on the AT. Each day that I hike I meet someone new. Often we just say hello and move on. Occasionally, however, a bonding relationship develops that may have long lasting significance. On the trail as well as in life, we never initially know how we may affect another just as we don’t know how another may affect us. We merely accept and appreciate the opportunity to have our lives interwoven with another earthly creature who just happens to be sharing a moment in time with us. I exist for the moment to walk a trail, a trail that leads to a destination that fulfills a goal. And as I walk I become. I become a man of determination and resiliency, a man with a passion for overcoming and defeating. The trail is not necessarily the enemy. 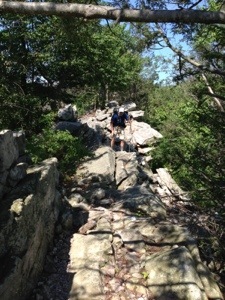 Still, it presents all hikers with confrontation and the need to persevere. So as I sit and dwell on the past and anticipate the future, I am oblivious to the present. It is a Sunday, Father’s Day. My mind journeys to a special day when I became a dad. Then it moves to another special day when Don became a dad. Finally, it travels to another special day when I became a dad to a daughter. Each day is forever transfixed within the memory. I can replay every wonderful moment of each of those memorable days of my life. They provide comfort at a solitary time. They give me strength to confront a new day with its potential tribulations. Tomorrow I will continue the hike. I will attempt to meet the challenges as I enjoy the beauty of my surroundings. I will focus on each step in the present, realizing that without notice, peril may await. I am grateful for this opportunity to hike. I hope to make the most of what tomorrow has to offer as I continue the northward journey on the unbelievably beautiful Appalachian Trail. Molar Man asked, “Are we almost to the road?” “I don’t know; we just came up over that rock pile,” replied the young man with his family. 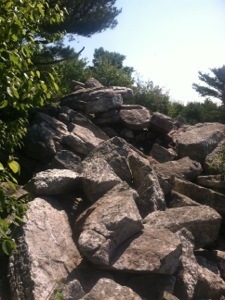 “Rock pile” is not exactly what you want to hear with less than a mile of a 12.8 mile morning hike remaining. As we neared our scheduled meeting with Sweet Tooth and Linda, we met a small army of day hikers, many of them children, on their way to I’m not sure what. We hadn’t really had any views to write home about all day. Still, the single file line of packless people continued. Molar Man and I smiled and said hello to the legion before finally reaching the Kimmel Lookout, the first truly awesome view in quite some time. 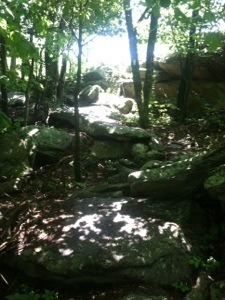 For much of the morning the trail had been a continuous stream of various sizes of rocks. More small ones than large slowed our pace at times. Occasionally, however, we still encountered level, gentle terrain. Early in the hike we missed a turn, which resulted in about a quarter mile walk off course. Fortunately Spirit and Steady were parked down the road. Steady appeared from the RV to greet us as “lost hikers.” Retracing our paths for the distance, we found the blaze that had been partially covered with graffiti. We then proceeded to climb over 700 feet. 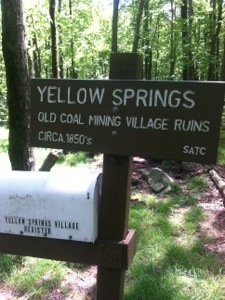 Other than Finder, we saw no thru hikers. 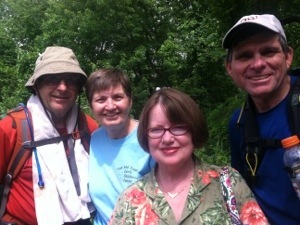 We did meet a couple from outside Philadelphia, Cathy and Ken, who asked about our hikes. After reaching the parking area on PA 501, unfortunately Molar Man and I had to bid each other farewell again. While he wanted to continue for a 22.1 mile day, I was content with 12.8 and a final afternoon with my wife before she flies back to GA tomorrow. Before we drove away, I walked the approximately 100 yards back down the trail with Linda, Sweet Tooth, and Spirit so that they could enjoy the Kimmel Lookout view. Linda then said her goodbyes to the other two ladies at the car before we headed into Pine Grove. 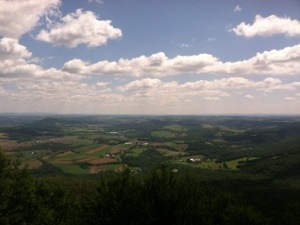 When we reached the outskirts of town near I-81, we stopped for lunch. As we ate I noticed Fatty across the road trying to hitch a ride. I hollered to her that I would take her back to the trail as soon as I finished my sandwich. She came in and joined Linda and me. I mistakenly labeled Fatty a section hiker in yesterday’s entry. The trim, vivacious young lady from Nova Scotia started at Springer four days after I began, yet we saw each other for the first time two days ago. Now living in Alberta, Fatty plans to visit her Nova Scotia home after finishing her hike in Maine. So Linda and I drove our new friend back to the trail before finding a room for the night. We then scouted out the best route to the airport and just did some driving, enjoying the countryside. Tomorrow will be a little sad. For the first time in almost two weeks I’ll again be hiking alone. I’m losing a wife, a friend, and a car, but the woods await. We never know what tomorrow may bring. For me it will most assuredly be more rocks, but it may also be an introduction to a new hiker who might also become a friend. 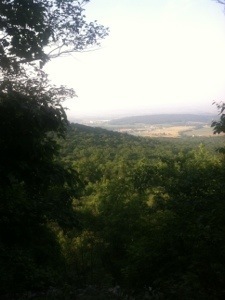 Whatever the new day may offer, the journey will continue up the Appalachian Trail. 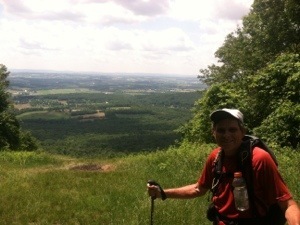 With a 25.6 mile day on the agenda, Molar Man and I headed up the trail from PA 225 at 5:50. I’m actually beginning to like these early starts. In less than three miles we passed Peters Mountain Shelter. Several tents still stood. It was also apparent that few had roused themselves from their shelter slumber at the early hour. So we hiked on throughout a partly cloudy, pleasant morning until we reached PA 325 where Sweet Tooth and Linda had parked. Even though it was still early, this would be our only rendezvous today. When we walked up I immediately recognized Pilgrim, who I hadn’t seen since Bears Den. He needed a ride to pick up a package in town, so Sweet Tooth agreed to help the Californian out. Also in the parking lot was Bernie the Whittler. He presented me with a hand carved whistle. 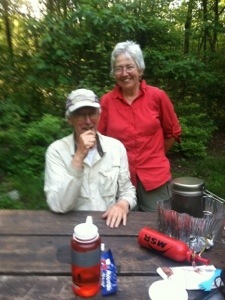 Bernie said that he was supporting his wife and her sister on about a 400 mile section hike. Under His Wing and In his Feathers were relaxing in the back of Bernie’s van. 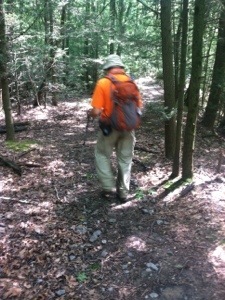 Before Molar Man and I continued our hike, thru hiker Finder and section hiker Fatty joined the group. I’m not sure why the trim, blond is using the trail name Fatty. Maybe I’ll find out in days to come. With 16 miles still to go, Molar Man and I hiked at a steady pace for the duration of the day, finishing just after 4:00. Throughout the afternoon we passed and were passed by a few. Blazer and Lentil hiked by on an uphill grade and quickly disappeared. Pfeiffer, who I had not seen since Daleville, and Calamity Jane also passed us. With gentle terrain except for a few stretches of rocks, it proved to be a good day for big miles. It was a personal best for Molar Man and came within .1 of equalling my longest mileage day. At one point near the end of today’s hike, we stopped to briefly chat with the four ladies who said they were having some girl time. Pfeiffer, Fatty, Finder, and Calamity Jane appeared to be enjoying their break. We also took a brief respite by a stream where Blazer and Lentil were resting. 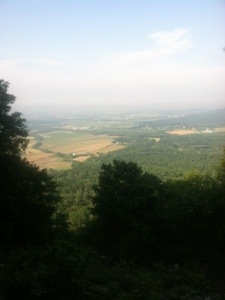 Molar Man and I then hiked steadily the final four miles to reach PA 72 earlier than we had expected. 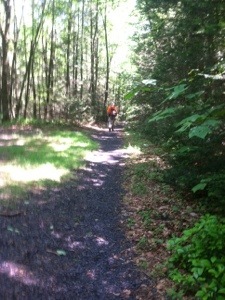 Right before reaching the road we caught Steady, who planned to hike the additional 1.4 to Swatara Gap. All in all, today’s hike lacked anything really interesting. 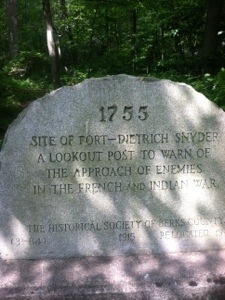 The trail intersected with a few other trails, and signs indicated where significant structures had stood in the past. I’m glad I got in the miles, but now I’m even happier that I’m about to take my lovely wife Linda out to dinner to celebrate her birthday. What better way to end another day of the adventure that continues on the Appalachian Trail. Molar Man suggested that I begin today’s entry with, “We hiked through a thunderstorm and nobody got killed.” I prefer, My phone rang at 5:45; Molar Man asked, “You ready to hike?” With severe weather in the forecast, I had set my alarm for 6:00, expecting to sleep late for a change. My friend, however, had a different idea. “The bad weather isn’t coming until 4:00,” he informed me. Famous last words is all I have to say. Because when we reached the trailhead a little before 7:00, the skies were rumbling. We looked at each other, told our wives goodbye, and proceeded to hike into a thunderstorm. Actually, the thunder, lightning, and rain didn’t begin until we had hiked almost a mile. When it did start, it poured, but only for about an hour. Thunder boomed occasionally, but the lightning really never seemed close. As the rain subsided, we both agreed that we were glad to be hiking the trail today even if it was a shallow stream for a few miles. After all, after the feet are drenched, it really doesn’t matter whether or not you walk through the puddles. Molar Man would later change socks at the break. I just hiked in wet ones all day. When the rain did cease, the humidity kept us sweating. Still we made good time, reaching Duncannon before 11:00. A warning that the trail was very rocky the last six miles into town didn’t seem exactly accurate. 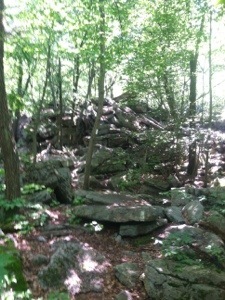 Sure there were rocks aplenty but not nearly as severe as what we would face on the last leg of today’s hike. When the trail reached Duncannon, famous among AT hikers for the Doyle Hotel, we were greeted with a road walk (or I should say town walk) for over two miles. A short block before the Doyle the trail goes west to High Street, following the street that runs parallel to Market Street until the edge of town. Before walking up to High we took a couple of pics of the majestic old hotel. We then meandered through a peaceful neighborhood until the trail turned east to head over the Clark’s Ferry Bridge and the Susquehanna River. After crossing over the river we met Sweet Tooth and Linda at a parking lot under the bridge. Also parked there was Spirit, Steady’s wife. She had been acquainting herself with our ladies in her RV. I also went inside to relax and eat a sandwich that Linda had brought me. With a longer lunch break allotted by Molar Man, it felt good to rest my feet. 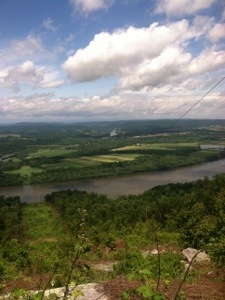 When we did start hiking again, we were faced with a climb of about 1000 feet which culminated with a spectacular view of the town of Duncannon and the Susquehanna. 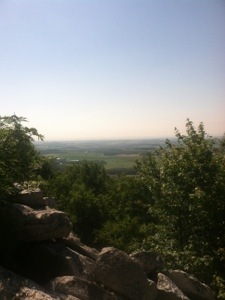 It was after the ascent, however, that the hike got dicey. 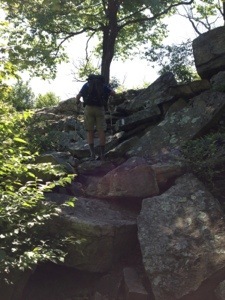 A very rocky stretch of trail, often requiring us to use our hands, slowed our progress over the last few miles. 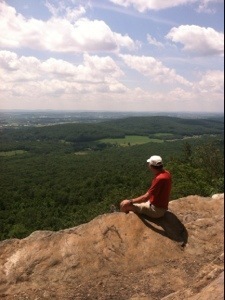 At one point I had to sit on a rock and carefully lower myself down about an eight foot drop. The change of terrain was fun initially, but then it got tedious. When we finally appeared past the last of the big slabs, we quickly picked up the pace to PA 225 where the ladies were waiting. Just before arriving at our destination, Molar Man and I were passed by Blazer, a thru hiker that neither of us had previously met. 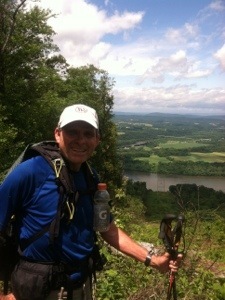 I’m 1149 miles into my hike and meet another hiker who started six days before me for the first time. Seems odd, but it continues to happen. Blazer hiked with us to the road where he was offered some trail magic by Sweet Tooth. Also visiting at the Volvo was Steady. 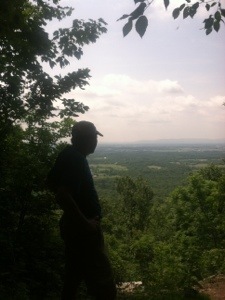 I had hiked almost a full day with him out of Waynesboro, VA over two weeks ago and had not seen him since then. Before we left the area, Tugboat, Life Raft, and Finder also showed up to partake of some snacks. When we did finally head for town, I followed Molar Man in our rental car. Within a couple of minutes I felt more like I was following George Costanza on his way to the Bubble Boy’s house. I barely had a glimpse of the blur of a Volvo as MM exited onto US 233. Telling Linda to hang on, I somehow maintained contact until we thankfully reached a traffic light. From there we made our way to a motel. In the parking lot stood OB, another thru hiker from GA that I had not met, but who had heard of me. His wife Mona had driven up to visit and slack pack her hubby for a few days. After a hot shower, Linda and I drove back to Duncannon because I wanted her to see the Doyle. While inside we met Paco, a section hiker who has been reading my journal. 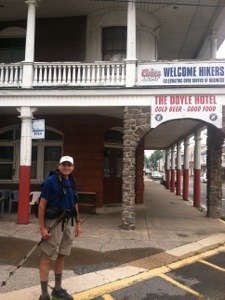 Having just finished his trek from Harper’s Ferry, he was relaxing at the old hotel. We took some pics, and then Linda and I drove back to our room. All in all it’s been a good day. Tomorrow Molar Man wants to do another 25 plus so I best get some rest. We aren’t sure just what the trail will have to offer, but with clear skies predicted, it ought to be a great day to continue north on the Appalachian Trail. 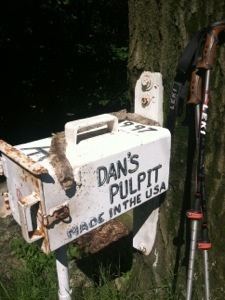 Apparently the section of the Appalachian Trail I hiked this morning is maintained by Old McDonald. 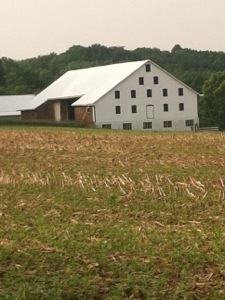 From a moo moo here to a corn field there, farm land existed as far as the eye could see. Over fence stiles and through several cow pastures, Molar Man and I hiked the first 10.2 miles to the Scott Farm Trail Work Center where Sweet Tooth and Linda met us for a short break. 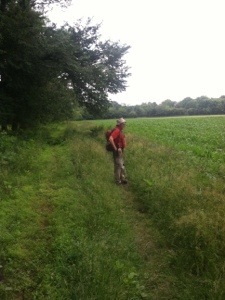 Then we covered the remainder of the 16.5 miles at a steady pace, finishing today’s hike in six and a half hours. With a few dark clouds overhead on a warm day, it was good to get it done early. 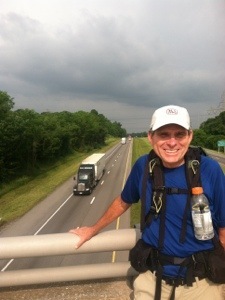 In addition to all the farm land, we also walked across three overpasses. 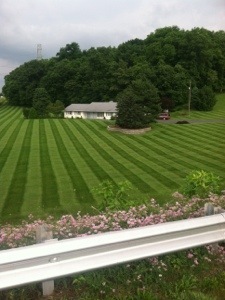 The trail crosses I-76, very busy US 11, and I-81. 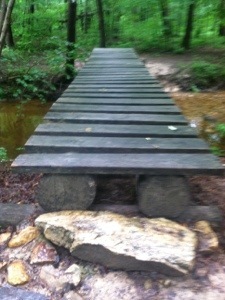 We also encountered more footbridges in the woods. 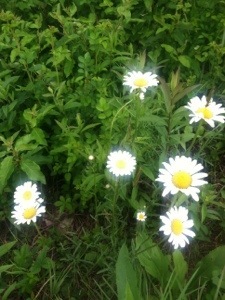 Some appeared to be new, especially in marshy areas. A portion of the trail ran adjacent to a muddy Conodoguinet Creek. 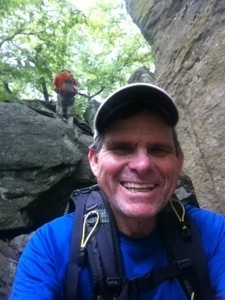 Other than a short climb of about 500 feet just before the Darlington Shelter, the trail remained reasonably flat, muddy, and nondescript for the final six miles up to PA 850 where Sweet Tooth and Linda waited. 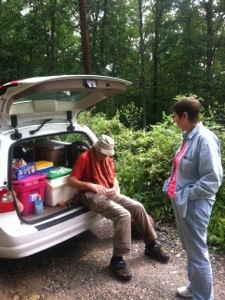 When we reached the small parking area, the ladies were talking with Mossy Brown, a 2009 thru hiker. She had heard about my hike from Walker when he, Whiskers, and Rocket had passed through the area about ten days ago. 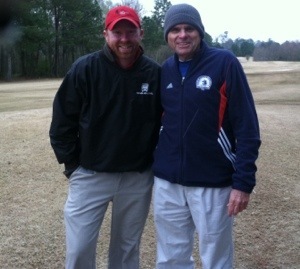 Walker had referred to me after Mossy Brown mentioned having a friend recently diagnosed with ALS. 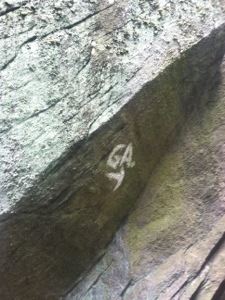 Not having seen any of these hikers since Damascus, it was good to know about where they are now. We chatted with MB for a while before heading back toward Carlisle. Even hiking with a buddy like Molar Man, there are stretches when neither of us has anything to say. I suspect that he, like I, is often lost in memories. Today is Wednesday. On Wednesdays last year Linda and I regularly shared a meal with Don and Lisa. It became our routine to meet at our condo. Don enjoyed wheeling his power chair out over the river before we would go inside. 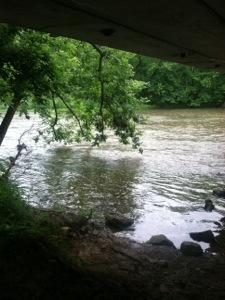 When he could still speak coherently, he quietly stated one night, “I like this place.” He was at peace by the river. I miss those Wednesdays. 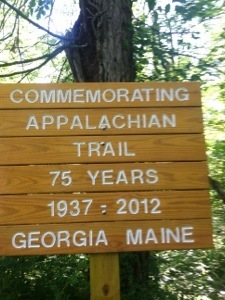 So another day has passed on the Appalachian Trail. For me it was day 82. Tomorrow severe weather is predicted, so Molar Man and I are going to wait for morning to plan our day. I’m not sure either of us is interested in any tornado blazing. Still, if it’s just rain, we’ll probably be back on the trail. Today proved to be another day that my brother would have liked. 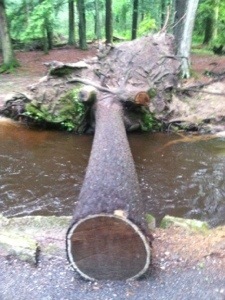 So I will walk on as I keep remembering how much…..Don loved the woods. 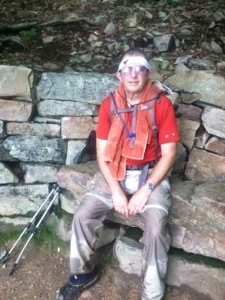 Some say the most important word for thru hiking the Appalachian Trail is flexibility. Due to a cancelled flight by Delta Airlines, today’s plans indeed required me to be flexible. After we found out that Linda’s flight had been re-scheduled to arrive late in the day, I decided to go ahead and hike the 19.6 miles into Boiling Springs with Molar Man. Since my plans didn’t change until late last night, I wound up only getting about five hours of sleep. Still, I hiked strong throughout the day, partly due to following behind the “machine.” Molar man’s ability to set and hold a pace of about 2.75 miles per hour is uncanny. I don’t even check the itinerary as we hike. He keeps me well-informed. When the alarm sounded at 4:15 I had already been up a quarter of an hour. Thinking I might find an all night restaurant, I headed for our meeting in my rental car at 4:30. A convenience store with hot breakfast sandwiches and coffee met my needs. As daylight approached, I sat in the car having my meal. Then I drove to the rendezvous with Molar Man and Sweet Tooth for the ride back to Pine Grove Furnace State Park and the beginning of today’s hike. No one else was around as we made our way through the manicured park and finally back into the woods. All went well early until we reached a spot where a white blaze led us down to a impassable stream with no bridge. Not seeing a blaze on the other side, I suspected that we had made a wrong turn somewhere. With his pioneer instinct, Molar Man bushwhacked to a spot to cross. Before I decided to go ahead and just walk through the ankle deep water, I retraced my steps up the trail to discover that the trail we were on should have been blazed blue. It looked as if a previous blue blaze had been painted over with white. When we finally got back to the real white blazes, Molar Man turned up the pace to make up for the ten minutes lost in futility. After approximately a twelve minute lunch break (long, by Molar Man’s standards), we continued to make good time until we hit the first of two rock mazes. The boulders of various sizes, from large appliances to small homes, required a degree of patience. With blazes aplenty and an arrow here and there, I thought the navigation of the mazes would be fairly easy. There’s that word that has no place on the AT again. Then I looked ahead to see Molar Man standing atop a two-story rock looking for an outlet. His choice of directions worked for him. 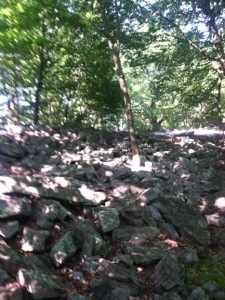 I went another way which required a little rock scrambling. All in all, the variety was refreshing. 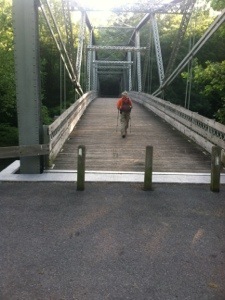 Like the other days in Pennsylvania, a number of footbridges were provided for most water crossings. 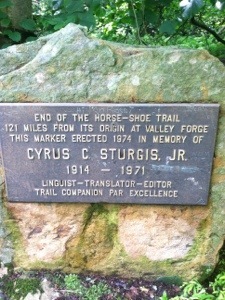 Late in the hike we passed Center Point Knob where a statue had been erected to indicate the original AT midpoint. 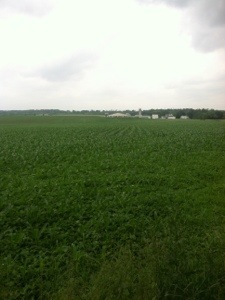 A short while past this landmark we found ourselves hiking a path that passed through a cornfield. 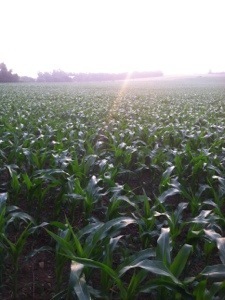 My dentist/engineer/farmer friend educated me on some aspects of corn growing. 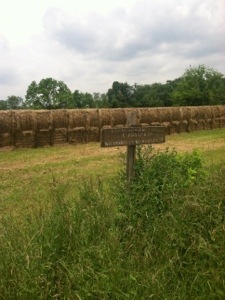 He also answered, “alfalfa,” when I asked, “What’s that?” After we walked through the farmland for over a mile and a half, we finally reached the small one way bridge leading into the quaint little town of Boiling Springs, home of the ATC Mid-Atlantic Regional Office. As the trail enters the town, it passes by a lake. A few fishermen sat in chairs at the bank on the warm, lazy afternoon. 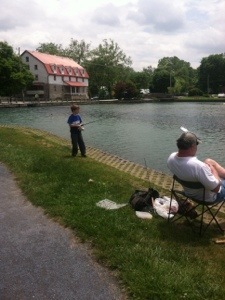 One young lad cast his rod as his dad watched. 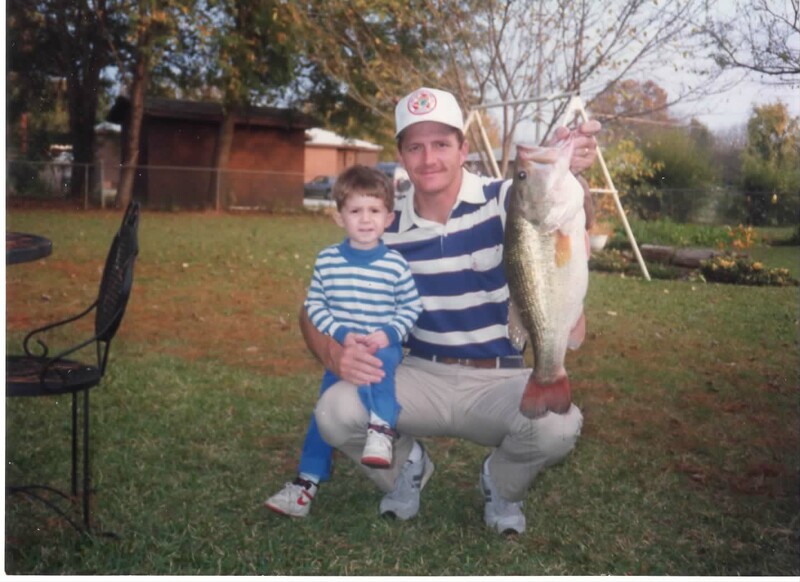 When he said he wasn’t catching anything, I noted, “But you’re having fun.” The dad replied, ” That’s what it’s all about.” On another afternoon twenty or so years ago, that could have been Don and Brent. My brother loved to fish with his son. And Don would have definitely loved Boiling Springs, a town that seems Mayberry-like in a peaceful way. I could see him relaxing by the lake, just enjoying. It’s been another good day to hike. 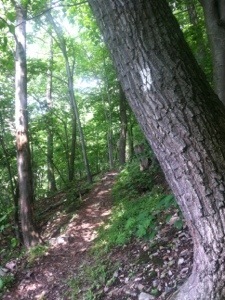 I shared a special section of trail with someone who has become a good friend. Our hiking styles, as well as our demeanors, seem to complement each other well. Tomorrow we’ll hike together again. For now, however, I’m off to the Harrisburg International Airport to hopefully meet Linda’s plane. If all goes according to plan, when morning arrives, she too will begin to learn just how special life can be on the Appalachian Trail.